I've been on a fish streak lately. I've been trying to stick with lean protein and simple sides that can be quickly prepared after work. They didn't have any cod at the grocery store so the closest thing I could find was "Pink Ling" sold in fillets. It's a bottom dwelling "eel like" fish. Apparently related to the "Assfish" (sorry I couldn't resist when I found that I had to work it in somehow), the fillet was pretty thin and the resulting dish was large flakey meat. 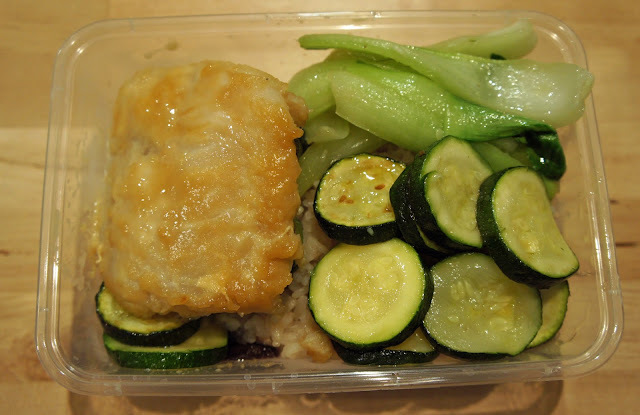 The meat has a little more elasticity similar to eel than say a cod that usually easily flakes apart. 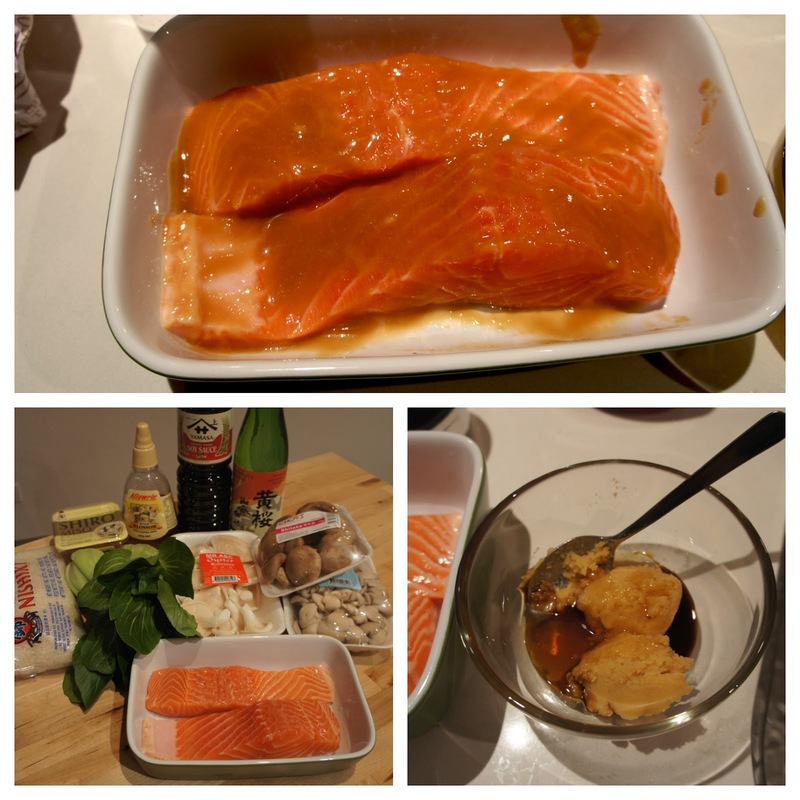 3 tbsp brown sugar, 3 tbsp miso, and 2 tbsp mirin. When you mix it you want a "watery paste", you want it a little runny, too solid and you get too much salt concentration, too watery and it won't stick to the fish. There are quite a few variations of the same theme that I've used in the past. I've used honey instead of the brown sugar, and added some soy for a bit more color. You can use Sake, Michiu and I've even seem some people use rice wine vinegar for liquid components. The recipe I provided below is my general "go to" version. Marinated for up to three hours. I was fine with 30 mins, I like the salty/sweet glaze at the top but too much can be over powering. I broiled it for 3-5 mins and then finished at 350F for 10 mins. Depending on the type of fish you use you'll want to adjust the temperature. The broiling part is to get some caramelization on of the brown sugar, you'll want to fiddle with the baking at the finish depending on the thickness of your fish. 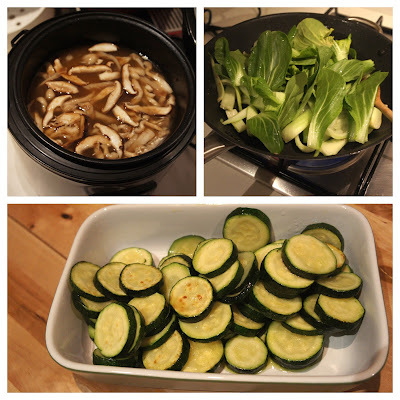 Nothing special on the sides, I just did a quick saute of a some bok choy (they call it pak choy here) and zucchini that I had on hand and made some more of the mushroom rice that I posted a couple of posts back. I've used the miso glaze on mostly white fish and Salmon, I'd stick to flakey type fish but I suppose you could use it on any type of fish especially if served with rice and vegetable sides. The miso glaze tends to be very powerful so you'll want to stick with more bland side dishes. 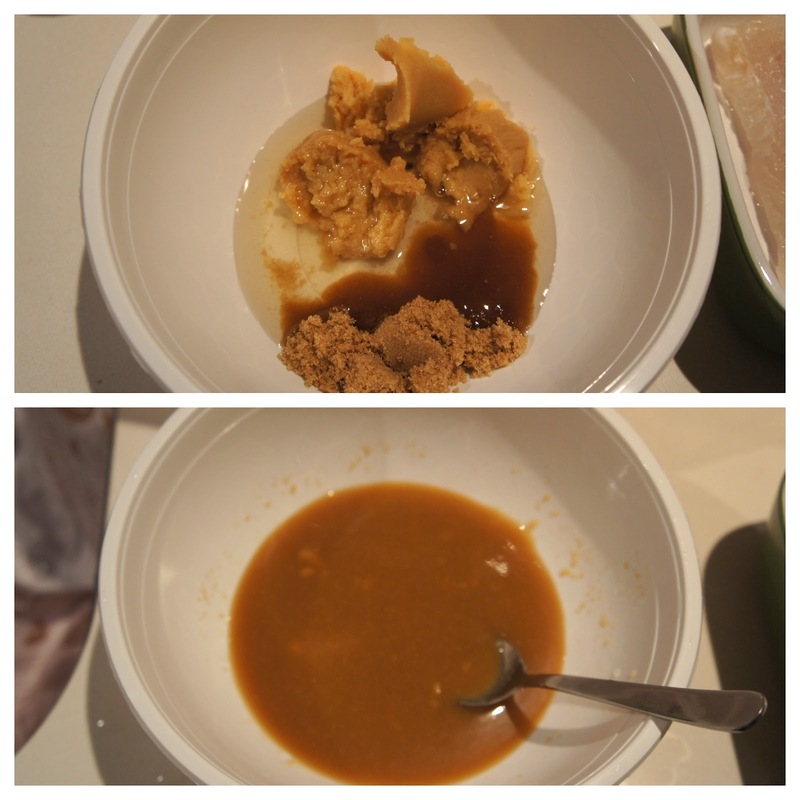 Mix the sugar, miso and mirin until you have a thin paste. Place fish in a shallow pan or sandwich bag and pour mixture over fish, make sure to coat all sides. Marinade up to three hours. Set oven to broil. Place fish on baking sheet and broil for 3-5 mins until the glaze starts to caramelize. Turn heat down to 350F and finish baking for 10 mins. First the ingredients. Small onion, couple of potatoes (I used a white variety, it holds up under a boiling), leek, paprika, butter, dill light cream and some vegetable stock. 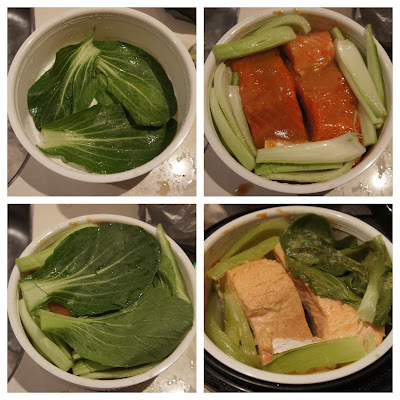 I opted against fish stock in favor of vegetable stock, I figure that the vegetable stock is a little more neutral and the Salmon was rich enough to provide plenty of fish flavor. I also went with salmon that had more of the belly attached since it's just fatty, tasty and a little more forgiving to reheating of the soup later. 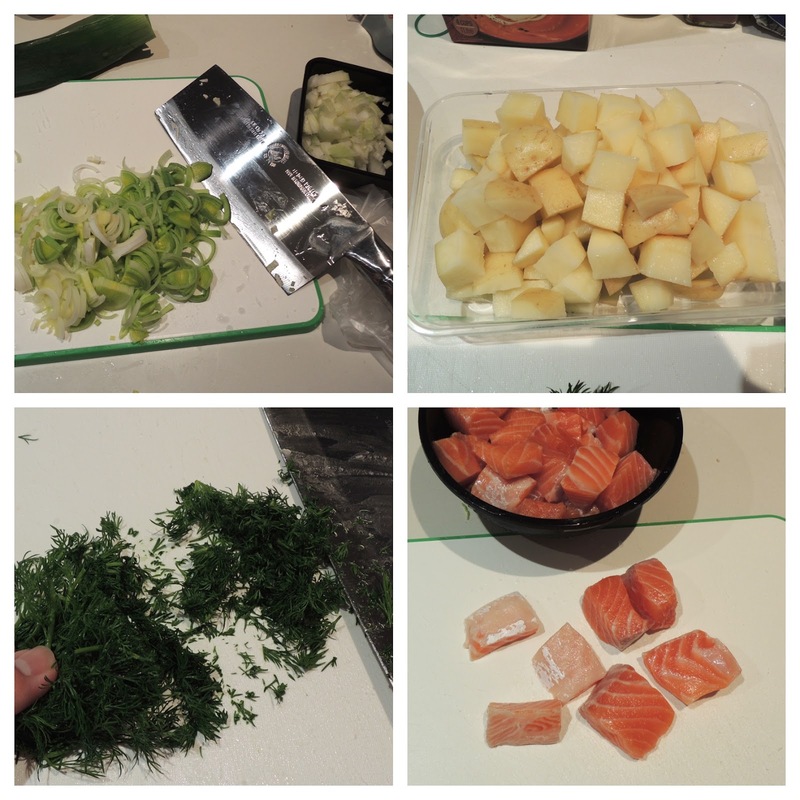 Prep: Sliced the leeks, cube the potatoes, dice the onions, chop the dill. Cut the salmon into chunk about 1.5 inches wide, we're working with fillet slices so they will vary in thickness but since we're being gentle about the cooking (no rolling boil and not too long on the stove) we won't have an issue with over cooked bits and under cooked bits. First melt the butter and saute the leeks and onions until soft. Add in your stock and make sure to scrape any brown bits off the bottom. Once the stock is at a boil drop in the potatoes and lower the heat to a simmer and cook for 15 mins or until the potatoes are soft. 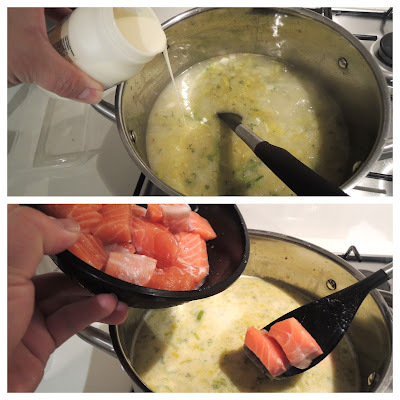 Pour in the cream and then add in the Salmon and cook for an additional 5 mins. Don't let the soup come to a full boil. Add all the dill and garnish with a bit of paprika. 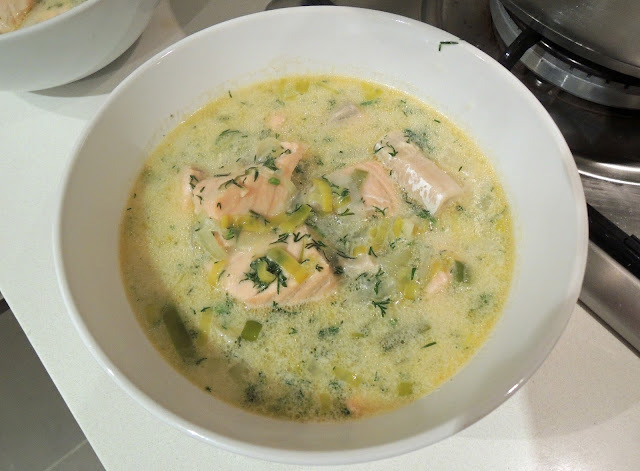 I made this during our winter months here in Australia and it made for a perfect one bowl dinner. I was surprised how filling it was. Melt butter in stock pot, saute onion and leek until soft. Deglaze pot by adding stock and scraping up any browned bits at the bottom of the pot bring to a boil. Lower heat to simmer and add potatoes, cook for 15 mins or until soft. Add a few dashes of paprika and chopped dill and serve. It's been a real struggle, I came to Sydney with two pieces of luggage and a backpack. The only kitchen device I brought was my Nomiku that burned out (but was replaced thanks to the generous Nomiku guys!) So it's been a struggle to choose what to buy and what to pass on. Only the essentials and multi-tasking is preferable 1) because of space and 2) because I'm not staying too long, so I can't afford to just replace everything I left behind. One of the items I really struggled with was whether or not a rice cooker was necessary. I have a rice cooker back home and it was the first kitchen device I ever owned. My mom got it for me when I left for college and that little six cup rice cooker has been my "go to" for everything rice, steamed and then some. It's one of those simple on/off cookers, none of that fuzzy logic business. I used my mom's tried and true "back of hand" method to measure water (amazingly it always seems to work and her hands are more petite than mine) and I seriously considered bringing it with me. But I didn't. In the end I finally broke down and purchased an inexpensive one, (I had no idea how expensive a proper one costs). This one features a nice non stick insert bowl/ steamer tray and a simple on off switch. Of course I was in a hurry to test it out and so I decided to give it a spin as a one pot bento. Next the fish. I went with a soy miso glaze: honey, soy, sake, white miso. This particular glaze I think was too thin for a steamed application, usually I broil/bake the fish. I also should have marinated longer. When steaming you don't get the nice caramelized glaze. I'll skip the recipe on this one you can see how simple it is. I'll post my brown sugar version in a subsequent post anyhow. 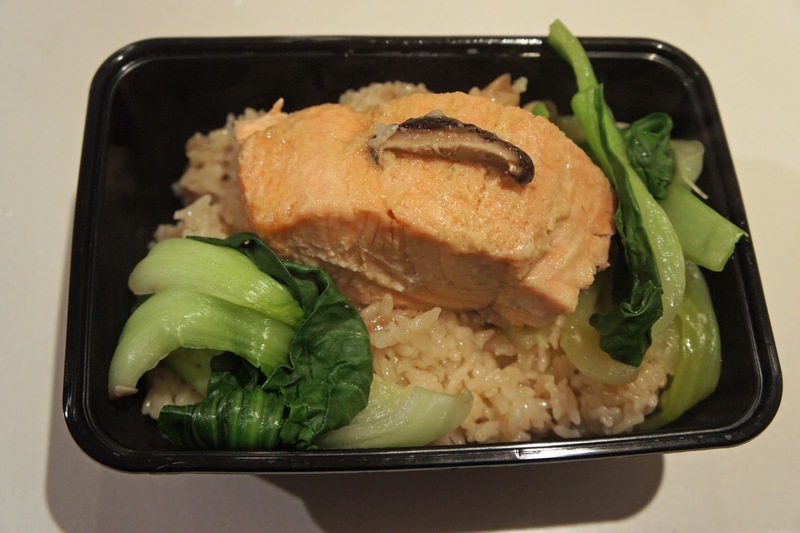 The idea was to put a bed of bok choy and let the salmon steam while the rice cooked with two servings of rice it should cook right about the same amount of time. 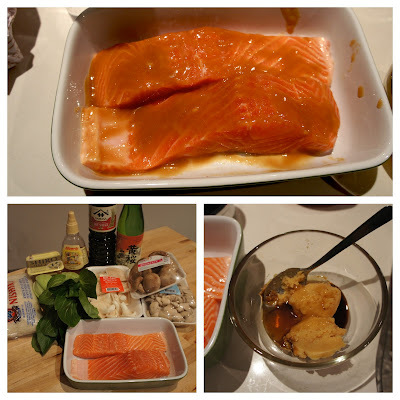 Any rendering fat and marinade from the salmon would have just flavored the rice. This turned out to be a perfect dinner for two and it took me about 20 mins to put together. The bok choy went a bit yellow in the steamer (the final bento picture I had blanched the remaining bok choy in dashi broth so it's a lot more green). The rice cooker is a Kambrook, (I would have preferred a Tatung but those were $140) is going to take a bit of getting use to, it burns the rice on the bottom, you get what you pay for I guess, this one only cost $30 AUD so I shouldn't have expected a lot but as a test to put out a quick dinner it's definitely a winner. I wouldn't call it a "rice master" but it's rice capable if you're willing to write off the bottom layer. 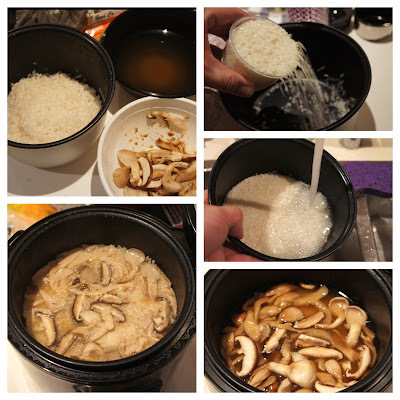 Allow rice to "rest" for 10 mins after the rice cooker clicks off.